Two-time Masters Champion Ben Crenshaw is well known for the following quote, “I’m about five inches from being an outstanding golfer – that’s the distance my left ear is from my right.” The true intention of this comment relates to the importance of mental toughness in golf. However, the distance from ear-to-ear is also a high priority when it comes to vision and sunglasses. Having the right eyewear on the golf course can go a long way towards playing better golf and reaching your full potential. I recently tested the latest golf eyewear made specificly for golfers from Under Armour. Over the years I’ve used sunglasses from nearly all the top manufacturers and have assembled my own list of preferences and priorities when it comes to the right eyewear for golf. At the top of that list is vision enhancement, the primary reason most of us wear sunglasses while playing golf. The Under Armour UA Core 2.0 sunglasses that I tested feature ArmourSight® Gameday lens technology that delivers up to 20% more undistorted peripheral vision. The Gameday lenses also provide a color enhancer that helps sharpen contrast, which is exceptionally helpful for reading greens. You don’t realize how important peripheral vision is in golf until you play a round in the afternoon sun without the right protection. It’s also essential for the golf swing itself, where your head position stays fairly constant throughout the swing. Having to look out the corner of your sunglasses to see the ball during the swing is definitely a recipe for disaster. 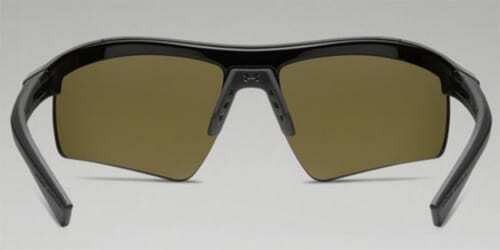 Another important aspect of these ArmourSight® lenses is durability. They’re up to 10X stronger than ordinary polycarbonate lenses, which becomes more important with each round of golf that you play. In addition to the lenses, the Ultra-light ArmourFusion® frames on the UA Core 2.0 glasses are made from a combination of titanium & Grilamid for superior strength & flexibility. Open up these glasses and you can tell they’re in it for the long haul. The cushioned hinges absorb shock and ensure a customized fit. In addition, the adjustable nosepad and temples help fit your face while the airflow technology really keeps you cool & comfortable. I’ve worn sunglasses in the past that seemed to trap moisture and humidity, while the Under Armour UA Core 2.0 does a tremendous job of releasing it. These sunglasses are extremely well made and built exactly to the needs and specifications of golfers. They may not improve your mental toughness on the golf course, but they’ll definitely help the five inches between your ears. The Under Armour UA Core 2.0 sunglasses feature ArmourSight® lens technology that delivers up to 20% more undistorted peripheral vision.